In the US, health among the most privileged is not bad; health among the disadvantaged is simply awful. In Baltimore MD, for example, men in the most down-at-the -heels part of the city can expect to live twenty years less than men in the leafiest part. Twenty years is enormous. The difference in life expectancy between men in the US and men in India is “only” 12 years. In India, national income adjusted for purchasing power is $5,150, one tenth that in the US, and a third of the population lives on $1.25 a day or less. It is unthinkable that anyone in the US could live on a yearly income of $5,150, let alone on $1.25 a day. Yet men in the poorest part of Baltimore have shorter life expectancy of 63 years, less than the Indian average of 64.7 years. The average American, with a modicum of empathy and concern for the poor, might ask: what does this have to do with me? The answer is: a great deal. First, the chances that the average American boy, age 15, will die before his 60th birthday is higher than in 49 other countries. Second, and linked, health inequalities, the health gap, is not confined to differences between poor and rich, but there is a social gradient in health – the higher the social position the better the health. Those of us in the “middle’ of the distribution are involved. Health inequalities are dragging down health of the average as well as being morally indefensible. There is clear evidence when we look across countries that national policies make a difference. But policies must not be confined to the health care system; they need to address the conditions in which people are born, grow, live, work and age. The evidence shows that economic circumstances are important but are not the only drivers of health inequalities. 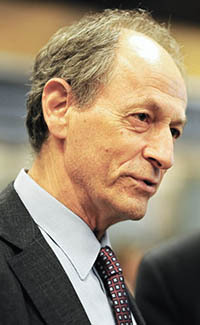 Michael G. Marmot is Professor of Epidemiology and Public Health and Director of the Institute of Health Equity at University College London, and he is President of the World Medical Association and President of the British Lung Foundation. He has been a UCL faculty member throughout his career, except for a brief attachment to the Medical Council just after completing his PhD. Michael has led research groups on health inequalities for over 35 years, and he has long been a leading figure working at the highest levels of policy and governance to bring adequate medical care to everyone, regardless of status, location and income, not only in the UK but throughout the world. He is a Principal Investigator of the Whitehall II Studies of British Civil Servants, investigating explanations for the striking inverse social gradient in morbidity and mortality. He leads the English Longitudinal Study of Ageing (ELSA). And he is involved in several international research efforts on the social determinants of health. Previously he served as Chair of the Commission on Social Determinants of Health of the World Health Organization, led the British Government’s “Strategic Review of Health Inequalities in England Post 2010” and WHO Euro’s European Review of Social Determinants of Health and the Health Divide. He served as Chair of the Breast Screening Review for the NHS National Cancer Action Team and served on The Lancet-University of Oslo Commission on Global Governance for Health. He also served as a member of the Royal Commission on Environmental Pollution. Among many honors, he was knighted by Queen Elizabeth for services to epidemiology and the understanding of health inequalities. He is a past President of the British Medical Association and a past Vice President of the Academia Europaea. He has been awarded the Balzan Prize for Epidemiology and the William B. Graham Prize for Health Services Research, delivered the Harveian Oration and has been awarded a Harvard Lowns Professorship. He is a Fellow of the Academy of Medical Sciences, an Honorary Fellow of the British Academy, an Honorary Fellow of the Faculty of Public Health of the Royal College of Physicians, and Foreign Associate Member of the Institute of Medicine. Michael earned a BSc in Medicine and an MBBS in Clinical Medicine and Surgery at the University of Sydney and an MPH and PhD in Epidemiology at UC-Berkeley. He also has been awarded honorary doctorates from 14 universities worldwide. Additional information on Professor Marmot and his work is available through the IHE website. Dr. Marmot began with a passage from Aldous Huxley’s dystopia “A Brave New World”, in which society was stratified by caste through deliberate tampering with human development. He explained that our society is similarly stratified due to the pollutant of poverty and argued that if the true effects of poverty were widely understood society would demand its removal as if it were any other toxin. Acknowledging that philosophy, as the term is now understood, is not ordinarily the business of PSW, he posed the philosophical question of what we mean by a “fair society”, positing that a key indicator is the fair distribution of health. If inequalities persist that are avoidable by reasonable means, he suggested, that is unfair. Politicians, of course, are bound to support equality of opportunity, in theory. The problem, he explained, is that the playing field is tilted. To illustrate the point, he presented a chart showing the income of adults versus those of their grown children. The US and the UK show high correlation, indicating low social mobility. Finland, Norway, and Denmark, on the other hand, show low correlation, i.e. high social mobility. Social mobility, furthermore, is correlated with the Gini coefficient, a measure of income inequality. Where there is high income inequality (such as in the U.S.), equality of opportunity is low, as demonstrated by a low social mobility score. Therefore, he concluded, politicians cannot profess to support equality of opportunity if they tolerate income inequality. He next noted that the mortality for non-Hispanic whites in the U.S.—in contrast to Western Europe, Canada, and Australia—has actually been increasing since the late 1990s. This rise is due primarily to suicide, alcohol and drug poisoning, and violence. Risk from these factors was inversely correlated with education. He further noted that although healthcare accounts for 17 percent of the United States budget, access to adequate health care is not a major factor in these risks. Instead, they arise from more systemic causes, including education level and firearm access. He explained that although the differences in life expectancy between the most affluent and the poorest neighborhoods is 18 years, even those in the median income group live lives 9 years shorter than the most affluent. Dr. Marmot said we must flatten the slope. He noted that income alone does not explain these differences. At low levels of income, small increases in income have a large effect on life expectancy, such as between starvation and survival, or access to fouled water versus clean water. However, at about $10,000 per year (a global average), the link to life expectancy begins to attenuate. Differences that persist are related to broader social factors linked to systemic inequality of opportunity, such as lack of education, un- or under-employment, lack of family cohesion, and lifestyle choices. These troubling data raise the question, “What can we do?” Dr. Marmot suggests that we can “break the link” between economic status and the developmental and health impacts that follow from deprivation. Dr. Marmot presented a study comparing child poverty before and after taxes and transfers. In countries such as Norway, Slovenia, and Sweden, the effect of the transfer was to cut the child poverty rate in half or better, compared to before the transfer. Dr. Marmot explained that the magnitude of this intervention is a reflection of how tolerant the society is toward child poverty. The U.S. child poverty rate, after accounting for social transfers, is worse than it is in Latvia. This suggests that the U.S. is not using the legal and economic “levers” available to it. He noted that these principles do not necessarily require national level action. Local and regional governments can choose to implement these concepts in their communities, and have done so to great effect in England and Sweden. Dr. Marmot concluded by suggesting that an alternate title for his talk might be “The Organization of Misery,” as socioeconomic misery appears to follow organized and predictable gradients based on a society’s structure. But he also saw inspiring examples that hope, too, can be organized. Noting the dramatic improvements realized by countries that have committed to these principles, he encouraged policy makers to do something, do more, or do better. One questioner asked about South Africa, which has recently experienced dramatic changes in social equality. Dr. Marmot noted that relative inequality with respect to income translates into absolute inequality with respect to outcomes. Thus, in South Africa the inequalities are still extreme, and so the outcomes remain similarly extreme. Another questioner asked why it appears that being or having been a world superpower correlates with increased inequality. Dr. Marmot noted, without hypothesizing, that China’s growing superpower status has been accompanied by rising inequality as well. Finally, a questioner asked about the apparent discrepancy in the effect of inequality on the health of men. Dr. Marmot observed that single men, whether unmarried, widowed, or divorced, suffered more adverse effects from poverty than women of similar socioeconomic status. He theorized that under difficult socioeconomic conditions, women were more adept at the social networking required to seize the benefits available from their limited social systems. After the question and answer period, President Millstein thanked the speaker, made the usual housekeeping announcements, and invited guests to join the Society. At 9:55 p.m., President Millstein adjourned the 2355th meeting of the Society to the social hour.